Nestled away in Guana Bay, this immaculate six bedroom, seven full bath private villa is one of its kind. 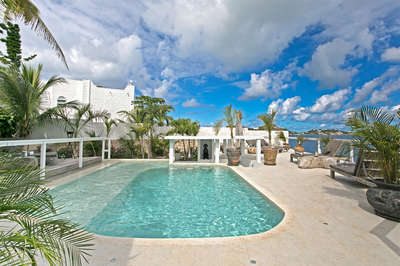 The villa boasts a private pool, spa, and a full gym. Services include: gourmet chef on site for three meals a day, housekeeping services, and butler services. • Outdoor space with 600 square foot heated saltwater lap pool, barbecue, bar and outdoor ping pong table. • Living area with 60" TV with Kiwisat, entertainment bar area and mini-bar. • Private gym with yoga mats, yoga straps, ball rolling and TV. • Automatic roll down mosquito screen.